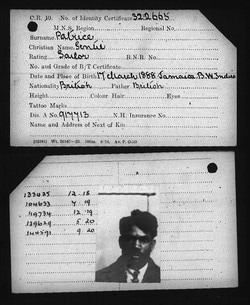 Sentil Patrice was born in the West Indies on 17 March 1888. It is probable that Patrice first went to sea at a very young age given that for a large proportion of his career he was employed as a sailor, rather than cook, fireman, trimmer or donkeyman. Thus, demonstrating that he overcame colour prejudice, which increasingly saw Black sailors typically take positions below deck towards the end of the nineteenth and beginning of the twentieth century. During and after the First World War he was employed as a sailor on many voyages to and from the port of Hull. He sailed with the crew of the Weltondale, Flying Coot and Visigoth. Although, his address has not yet been found, it is probable that he was based close to the port. On 7 November 1919, he applied for his First World War medals which were sent to the Merchant Marine Office in Hull. However, like many sailors he did not collect them because he was at sea and they were returned before he had arrived back home. By the early 1920s Patrice had moved from Hull to another port city, Cardiff. In 1924 was employed on board the Somerton which sailed between Rio de Janeiro and Seattle. In 1927, Patrice had been promoted to the rank of Able Seaman on board the Glenaster which sailed from Swansea to Progreso, Mexico and back to Plymouth in the summer of 1927. Although, he was rarely on dry land, in the winter of 1928, Patrice married Gertrude L Davies in Cardiff. The records are extremely sparse for this time. However, it is probable that he continued to work as a sailor throughout the 1930s. When the Second World War broke out in 1939, Patrice once again became part of the Merchant Marine. The following year, he boarded the Lombardy which sailed from the Barry Docks on 10 July 1940 and arrived in New York City approximately two weeks later. Patrice was part of a generation that witnessed two global conflicts. He is one of only a few men who participated in them both. Almost a year after the war had ended, in the summer of 1946 Patrice married Lily Felix. However, his second marriage was short lived as in December, after surviving two World Wars, he died at the age of 58. Civil Registration of Death Index (December 1946), 8b, p. 161.